This post is about two things I completely LOVE – pizza and a new product that is totally awesome. 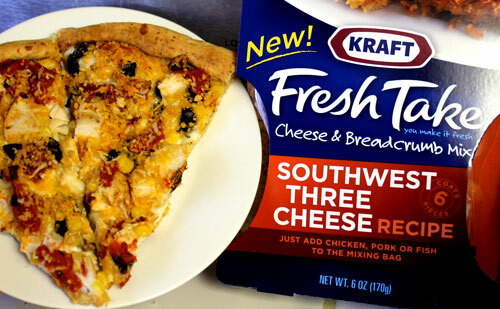 The other day I went to buy some shredded cheese for a homemade pizza and saw Kraft’s new Fresh Take Cheese & Breadcrumb mix – I knew I had to try it! There is a photo of delicious looking chicken on the cover of the package but that is not what I had in mind. I had pizza on the brain – warm, cheesy, tasty-pizza goodness. I picked up the rest of the ingredients I needed for an easy pizza and headed home. Check out my shopping trip here on Google+ - we found some real fun stuff. It’s a mixture of breadcrumbs and cheese, sold in a resealable bag. The two are not mixed together in the package – but divided by a removable separator. 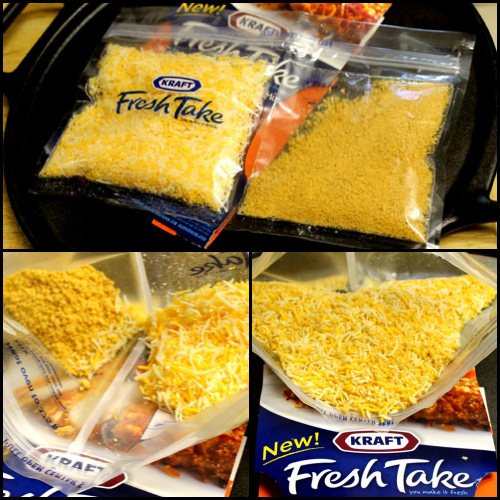 Once the divider is unsealed, the breadcrumbs and cheese can be mixed in the resealable bag. Then you can add chicken, pork or fish to the same bag and coat with the breadcrumb mixture. 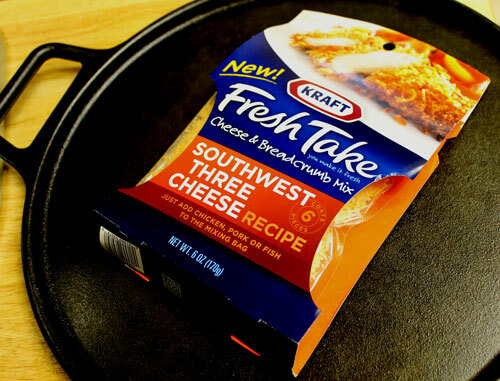 I love how Fresh Take uses fresh cheese and helps make clean-up a little easier. 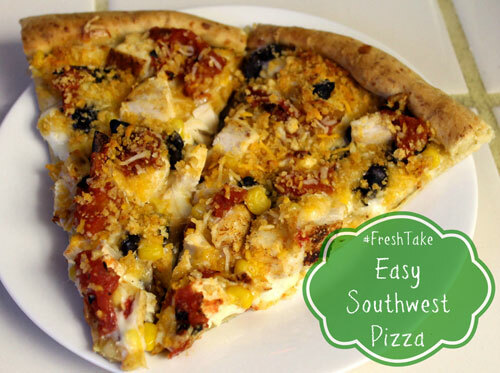 Although I made pizza this time – I really want to try Fresh Take with chicken, I imagine the tastes are awesome! 1) The recipe is written to be made with a stand mixer – the job can get done by hand as well, it will just require a little elbow grease and a bit of patience. 2) I use a pizza docker that places rows of holes on the dough before baking it. This helps the dough to NOT rise in those areas thus making the middle of the dough flatter than the crust when baked. A fork works for this task as well. 3) All ingredients used in this recipe can either be made fresh or bought pre-made in the store. I used homemade black beans, but of course canned would work just fine. 3. Wait about 7 minutes or until yeast mixture is foamy. Add flour mixture to stand mixer and mix on speed 2 for about 7-10 minutes, adding olive oil once most dry ingredients have been incorporated into dough. 4.Either using your hands or a rolling pin, spread dough out. I was able to make a 14” pizza, with crust, using this recipe. Poke holes into base of pizza dough once rolled out using a fork or pastry docker. 5. Bake for 6 minutes, rotating dough once. 6. Remove and add ingredients in the following order: ranch dressing, monterey jack cheese, chicken, black beans, corn, tomatoes and remaining Kraft Fresh Take. 7. Bake for 10 minutes, rotating pizza once. 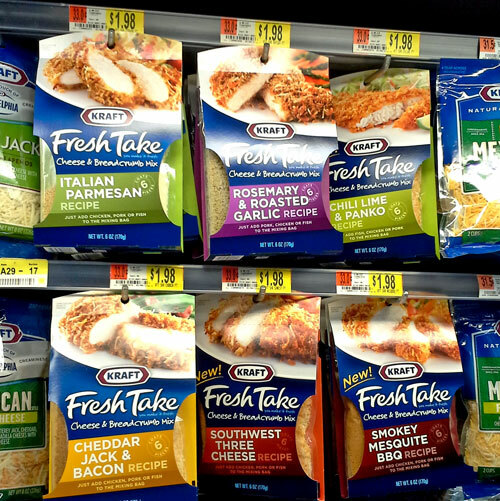 From March until July the Kraft Fresh Possibilities Tour truck will be making stops across the country! Check their site here to see if they will be making a stop in your town! !